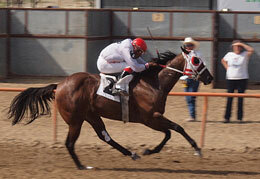 James Diva, under jockey Jose Guzman, winning the Wyoming Bred Futurity at Sweetwater Downs on Sunday. ROCK SPRINGS, WY�SEPTEMBER 1, 2013�>It was all James Diva in the $19,975 Wyoming Bred Futurity on Sunday. The Ivory James filly rolled to a 1 � length win, her second in four starts, to pickup the winner's share of $6,991. Jorge Garfias trains the bay miss for owner Pedo Mena. Ridden by Juan Guzman, the filly out of Diva Star(TB), by American Champ (TB) was bred by Ed Peters. Broken Bones Cattle Company's homebred Eyesa Special Roscoe earned $3,196 for finishing second. Jesse Villegas trains the 2-year-old gelding. Jesus Peralta had the riding assignment. Its Ms Perry To You, a homebred filly racing for Gerald Kaul finished a neck back in the show position. Travis Lusk trains with Tyson Lusk riding. Eyesa Sleepy Sandman, Cartels Little Diva, A Streakin Tres Seis, Thisnannysgotmoves, Rabbit Klaws, Cute Luci Lou and Six Streakin Ettabo completed the field.